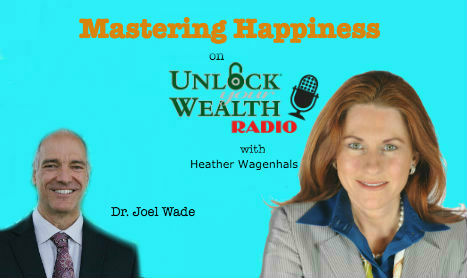 Master Your Happiness with Dr. Joel Wade on Unlock Your Wealth Radio with personal finance expert and host of Unlock Your Wealth Radio, Heather Wagenhals. In this interview Dr. Joel Wade helps listeners find their true happiness, starting with one’s character and explaining this is a reputation that we build for ourselves. Last month we talked with Dr. Joel Wade about the gifts we were given and this month we discuss character, courage and strength we build. In a recent study researchers concluded that individuals behave better when a mirror is in the room. Dr. Joel Wade continues with the “mirror” analogy by encouraging listeners to always see that mirror and consciously take the mirror with you as you make choices that will reflect on your integrity and values. Saturday, July 16h from 2:00pm – 2:50pm. 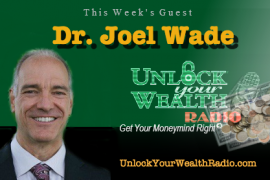 Tune in to this interview as Dr. Joel Wade continues the topic of Mastering Happiness by learning how Grit is tied into Happiness and how this Grit can help us overcome challenges in our personal and professional lives.